This is the ninth book in the Hannah Swenson series and I think the strain is showing on Fluke. I have enjoyed the series so far, but this one focused more on the fairyland of Lake Eden then it actually did on the murder mystery. Because this is the ninth book, I guess I can allow for this detour. I’ve already invested a lot of time and emotion into the books so I’m hooked. During rooting for her sisters and nieces in the various pageants (beauty, mother-daughter look-alike, and cutest baby), trying to decide which man to marry (Norman or Mike), resisting joining the 21st century, and trying to figure out her mother’s latest project, Hannah sets out to solve the murder. She does eventually solve the murderer which really doesn’t come as a surprise. The main focus seems to be on who Hannah will decide to marry: Norman or Mike. I personally think she’ll pick Norman mainly because the Fluke has picked Norman and has thus skewed the reader’s choice by making Norman more accessible and desirable, thus more favorable. Norman is building their dream house they designed for a contest in a previous book. Mike is sometimes viewed as an egotistical, macho man who makes Hannah’s heart flutter like a hummingbird on coffee (Hannah’s drink of choice). Norman is stable and thoughtful while Mike is the dreamboat. Mike is the fantasy, Norman is the stability. I enjoy the series despite the fact that the mystery is becoming diluted through the recipes. 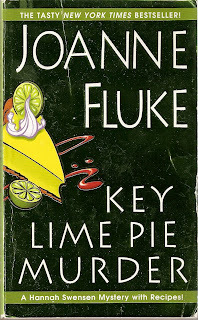 It still smells like success and I really need to try a recipe of Hannah (Fluke) recipes. Curious - you say this one is not as good in comparison to the others before it in the series. Has it been progressively going downhill or was this one just a fluke (no pun intended)? It's been progressive. I think the author is so comfortable in this series or the fans are requesting more home life information. This story focused more on Hannah's life than the murder. The writing is still the same there's just been a focus shift.